My cats are addicted to the laser dot. It’s problematic in that I keep 2 lasers hanging on bedside table. Every morning, I let the cats into my bedroom and they begin a quest to reach the lasers. I’m not a fan of playing laser dot. It eventually cramps my fingers from pressing the button and it’s awkward to run two different dots in two different parts of the room. But they won’t share a dot. And Tim is ruder than Bijou, he is entirely focused on the chase and has no boundaries when the chase is on. Her calico highness will just sit back and wait for him unless it’s directly in front of her. But that means she gets very little fun or exercise from the dot. So I usually have two going at once. It’s the quest to reach the lasers that is annoying. Because I’m between them and the bedside table. More accurately, I’m the path they prefer to the bedside table. They could just jump up from the floor, but that isn’t quite so annoying and therefore not Good Cat Policy. And then once on the table there is a great deal of pushing and biting at the pointer as though this will some how create a dot that they can chase. This often involves knocking things over and is noisy. They understand I’m the one moving the dot. It’s not a mystery to them. They still adore it. 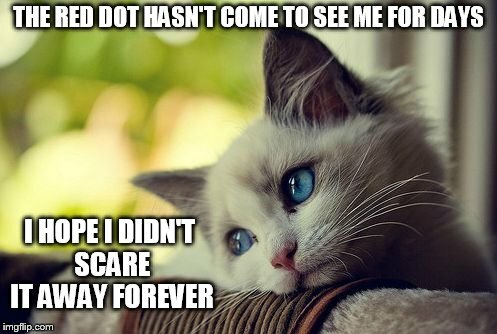 Lily loved the dot as a kitten until she realized it wasn’t real and that I was the one creating the moving dot. Then she lost interest entirely and never did more than watch it with bored disinterest. But they get it fully and still ADORE the dot. We are having a lovely winter storm in Spring. Much hand wringing and disaster predicting has happened for a week. And after stepping back from the dire predictions of 12″ the weather people have come to the unreasonable conclusion that we will have at least 2″ and as much as 8″. In spring. I’m just saying. Mother Nature is off her meds and someone needs to see to it. Anyway, Tim was sitting in the window, watching the big fat flakes falling and swirling and clearly feeling like he was missing out on a fun time. So I let him out on the balcony. He ran out like he was going a play date. He arrived back looking a bit cowed. It was COLD, MOM! Also, despite a desperate attempt to cajole her, his babysitter, Mrs. Fluffy Pants, aka, Her Calico Highness, known to her familiars as Bijou, FLATLY REFUSED to go out into the cold. The advantage to age is knowledge. He was clearly disappointed in the whole experience. Poor Rebel Tim. Life is so much more disappointing than one expects when looking out a window. But don’t worry. He has overcome his disappointment and is current chasing ghosts at top speed through the apartment. Bijou and I are less active on Saturday Mornings. We have elected to watch his antics rather than participate. I’ve recently been covered in fur. I took my cats the to vet. When cats are stressed they shed. ALOT. I, and I would imagine most caretakers, try to comfort the stressed cat at the vet by petting and cuddling it. This transfers all the fur on their body onto your body. I did it twice because Bijou, her calico highness, has deep and unnatural hatred for the carrier and I think she would probably rip poor little passive Tim into a bloody pillow if I took them together. Particularly since I only have one carrier. It’s a bigger carrier, and it would hold them both if required, but I decided it wasn’t required. Bijou hates the cage so to her the actual exam room was not terrible. She explored it thoroughly while we waited and clearly developed an escape plan. She didn’t hide from me when I picked her up and put her on the table and submitted with dignity to all the indignities they did to her. Tim, however, doesn’t think the carrier is a cage of horrors. So he had to be pulled out the carrier and then glued himself into me, hiding his little face in the crook of my elbow. There is very little as pathetic and endearing as a cat burying its face into you for safety. He did not see the exam room as an interesting place to explore. Which is upsetting because he’s going back next week for his neutering. When I turned away from him to get my purse he jumped off and hid in a corner under the chair. When we finally let him back into the carrier he scrambled in like it was home sweet home and settled in the back. People who don’t have cats probably think of them as a monolithic sort of detached personality. But they are not. Like humans they come in a huge spectrum of personalities and a trip to the vet is a great place to see that. Particularly this vet because they have a big orange office cat who helps the receptionists. He likes to lay across the keyboards and get in their way as much as possible. He has no fear of the barking, and meowing going on in the waiting room. He thinks all animals are inferior to him. It’s written so clearly in his attitude. There was a whining pit bull in the waiting room. His pathetic cowering noises made my Tim look brave. Office Cat looked at that dog like he would not have bothered to bury him after he took him down in any fight he cared to enter into. And despite the odds, I think I would have taken Office Cat in that fight. But office cat didn’t even growl at him, just looked disdainful and walked away. He’s wise and generous. He let the dog live and didn’t jeopardize the good life he’s leading as Official Office Cat. Anyway we all survived and Tim will be deballed next Friday. They mostly grow on their own, but they do need a lot of food. When you get a young kitten it is a delicate fragile ball of bravado. They walk around, with the tiny brush tails sticking straight up and act like NOTHING can hurt them. But just picking them up makes you utterly aware of how they are just fragile bones covered in fur with a tiny buddha belly if they’ve been eating properly. Then they grow. They stretch out in all directions and look mostly starved, like lanky teenagers often do. They hold onto that fragile feeling because all the major muscles that bind together cats and make them such tangibly tough animals haven’t quite caught up with the growth. So you pick them up, expecting to hold something solid with weight and instead you get a floaty bundle of fur. Which sounds more romantic and relaxing than it is, because it’s actually a spastic floaty bundle and so you have try not to break the fragile spastic kitten that refuses to sit still while you hold it. And then their muscles catch up. And one day you pick up a kitten, thinking it will be floaty fragile flotsam and it’s a solid chunk. I love the solidity of cats. The fact that they can be given a good solid patting and it sort of rings on their body. And what is most fun is that cats seem to like a good solid patting. I call it banging on the kitty. I mostly do it on their back leg or their back. But it can’t be done to a fragile kitten. Rebel Tim has just started to get his solid muscles. And so I gave him some bangs and he loved it. You would think cats would hate that sort of thing. But I’ve never had a cat that didn’t love it. Often it riles them up and they end up running around like maniacs. Unsurprisingly this is how it worked on Tim. Tim is going to be one of those long lanky cats that are mostly just sleek fur over defined muscle, unlike Mrs. Fluffbutt, Her Highness Bijou. Who is mostly thick fluff pasted to muscle and a bit of rounding out fat. She is an exceptionally comfortable cat to hold as a result. Just soft in all the ways. Until she wants down. Which is mostly immediately because she doesn’t enjoy being held. She wants cuddles on her terms. But every evening she condescends to allowing me pick her up for a good hug. And doesn’t even complain. Whenever I have more than one cat, I always end up with a favorite. It’s nearly always the one I’ve had longest. In fact, I think it ALWAYS is? I can’t think of an exception. Anyway, despite only being with me a few months, Bijou, Her Calico Highness, is my favorite. And I feel really bad about it. Because on all metrics except possibly pure beauty, Rebel Tim is probably more lovable. He’s never the one who growls or spits. Although to be fair, Bijou was universally cheerful and sweet until the arrival the Rebel Tim, so. But I got Tim for Bijou. I feel like he belongs to her. I just take care of him for her, because she’s royalty and cannot be expected to manage his needs. What’s more, I’m pretty sure Her Calico Highness knows that Tim is hers. He is naturally oblivious. He just loves her. And me. Probably equally because he’s that sweet. Anyway, it’s not like I don’t love Tim. But I have a preference for Her Calico Highness. I am glad I never had kids. I imagine I would have had a favorite and that would be awful. So anyway. This has been the confession of Sara, guilty cat lover.